Most people don’t know this, but what was to become the original part of the Colony of Georgia was, at one point, part of the South Carolina colony. That colony’s boundary went as far south as the Altamaha River. 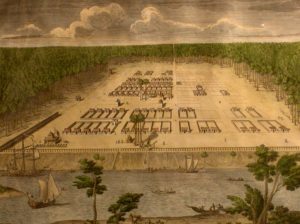 It had even erected a fort on the north bank of the Altamaha called Fort King George. But to be honest, anything south of Beaufort, was more of a nuisance to them. So, in the late 1720’s, South Carolina gave up all claims south of the Savannah River. Meanwhile, the Spanish to the south (in St. Augustine) were also claiming that same territory. So, the land between the two European powers at that time, was a no man’s land. Over in England, a man named James Oglethorpe had a plan to take people out of debtor’s prison and bring them across the Atlantic Ocean to what was called the British West Indies. His idea was to begin a new colony in order to give them a second chance in life. King George the Second liked the idea. His thinking was to give Oglethorpe and the men who supported him a charter for the land between the Savannah and the Altamaha rivers, as a buffer of poor people between the Spanish and Charleston – which happened to be his most valuable colony. Oglethorpe’s plan was more noble. While he certainly wanted to expand the British Empire, and maybe take out St. Augustine in the process, his plan was for the betterment of these destitute people. Now, no one actually came from debtor’s prison, but poor people were brought over. The ship Anne left Gravesend England with about thirty-five families in late 1732. After stopovers in Charleston and Beaufort, the town of Savannah was founded on Yamacraw Bluff, eighteen miles up the Savannah River, on February 12th of 1733. A treaty was signed between Oglethorpe and the Yamacraw Indians, and the colony of Georgia had begun.